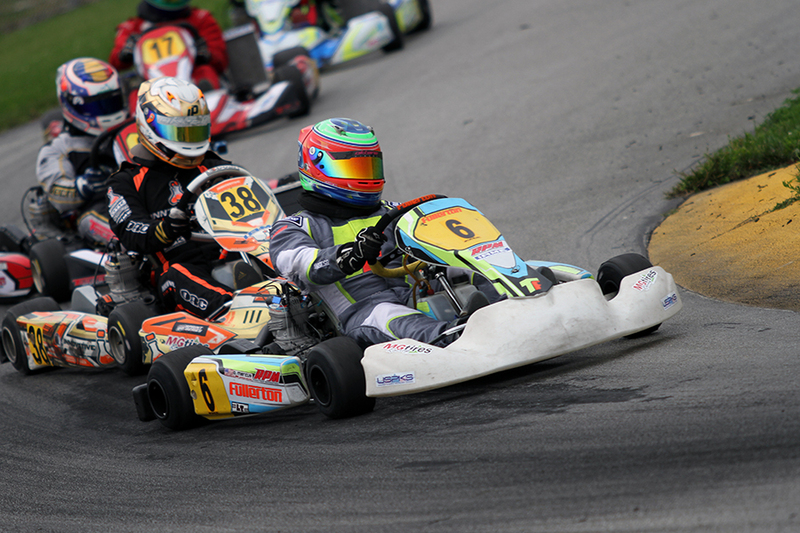 The United States Pro Kart Series put in the final chapter of the 2018 season Sunday at the New Castle Motorsports Park. The Hoosier Grand Prix closed the sixth year of the program, with Championship Sunday deciding the seven IAME championships on the season. While it was an overcast day, the rain stayed away from the New Castle, Indiana in order to get qualifying, Prefinal and Final to crown this years title winners. 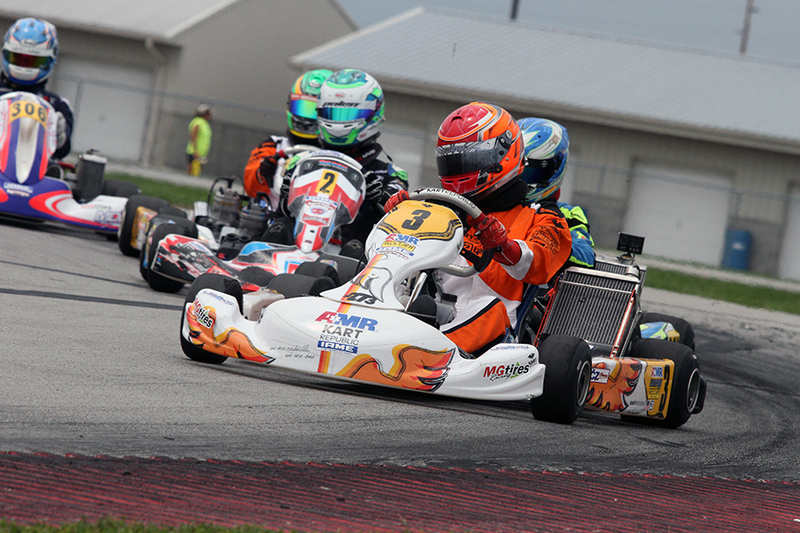 For the first time in the six year history of the USPKS program, there is a repeat champion in the IAME Pro division. 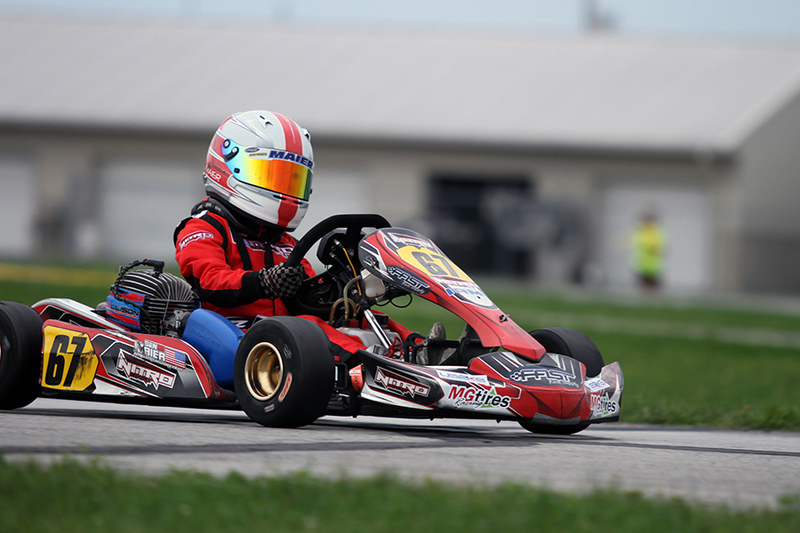 Not only a second title, but in two straight years for KartSport North America driver Brandon Jarsocrak. 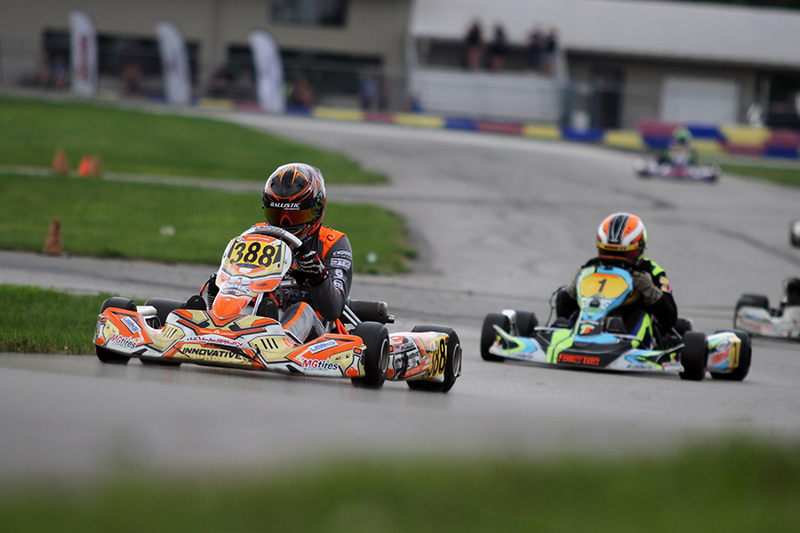 Victory both days at GoPro in June helped put Jarsocrak (Kart Republic) into the championship hunt. His sweep of Round Five on Saturday gave him the edge going into Sunday. 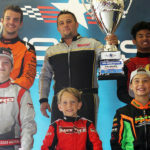 A perfect weekend was broken up by Kart Republic driver Alex Bertagnoli, with the Franklin Motorsports driver stealing the fast time in qualifying. Jarsocrak came from fifth on the grid to claim the top sot in the Prefinal ahead of Zach Holden (MDD / Kosmic). They along with title contender Austin Garrison (Fullerton), Bertagnoli, and Austin McCusker (MDR / Kosmic) made up the lead pack in the 18-lap Final. The five drivers put on a great show with clean, calculated and exciting racing with Jarsocrak, Garrison and Bertagnoli mostly at the point. Bertagnoli went off in the closing laps and Jarsocrak secured the lead, showing the way for the remainder of the race to score his fourth victory of the season. The win locked up his second straight title, and a second straight year to the IAME International Final. Garrison ended up second, earning six top-five finishes and four podium results on the season. 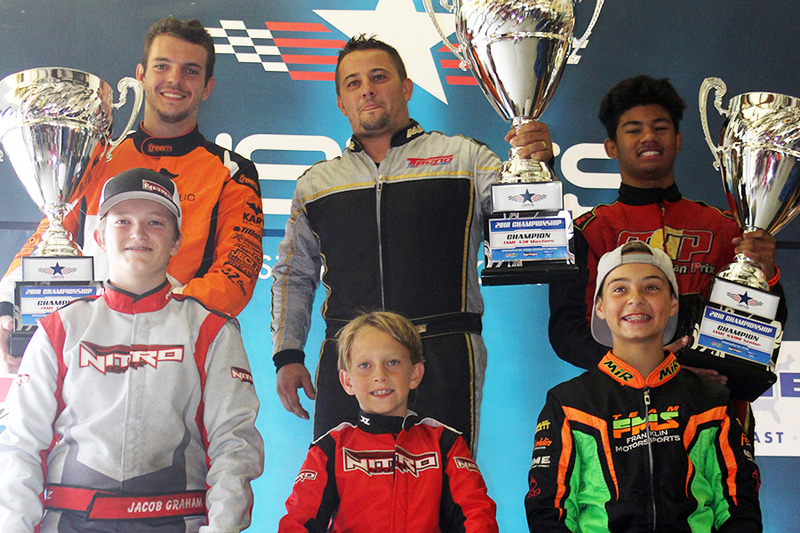 Holden grabbed the final spot on the podium in his return to karting at his home track. Austin Schaff (FMS / Merlin) and Lane Vacala (CompKart) ran down McCusker, however, Schaff was penalized two spots for avoidable contact. That moved Vacala to fourth and McCusker to fifth. Colton Ramsey was able to complete what he started on Saturday in KA100 Senior. Ramsey (Innovative / Exprit) won both heat races on Saturday but came up short in the Final. Sunday, Ramsey started on the front row alongside Mike McAndrews (Fullerton). At the drop of the green Ramsey jumped out to the lead as the pied piper of the nine-kart lead pack. Everyone behind him was racing to be in the second spot, while Ramsey continued showing the way for all 18 laps and his first victory of the season. The fight for second was exciting all 18 laps, with what was again clean and competitive racing. Zach Hollingshead (OGP / Tony Kart) put a stamp on his championship season with fast lap of the race and winning the runner-up spot at the line over McAndrews. Top qualifier Josh Hotz (FMS / Merlin) was fourth with vice-champion TJ Koyen (Innovative / Exprit) was fifth. 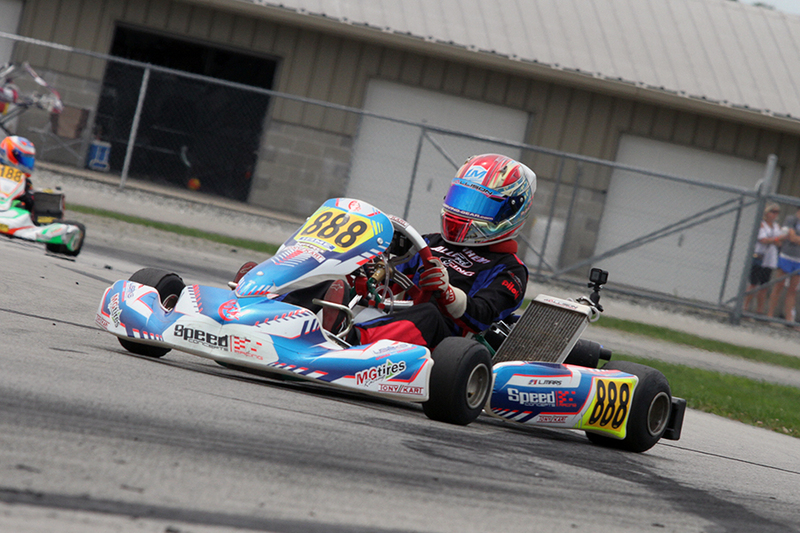 The weekend nearly ended with a sweep in the IAME Junior by Jeremy Fairbairn. The three-time winner started Sunday as the driver to beat with fast time in qualifying and winning the Prefinal. Fairbairn (MDD / Kosmic) would not last but two laps with a mechanical failure and ending his run at five straight victories. This opened up the door for two drivers at the chance to earn their first victory in the category. Santiago Trisini (Kart Republic) and Luca Mars (SCR / Tony Kart) got away from the field with Mars pushing the Junior rookie nearly the entire distance. Mars pulled the trigger on the final circuit, edging out Trisini at the line by 41 thousandths for the victory. Championship leader Nicholas Terlecki (FMS / Merlin) was able to get away from the field as well, running alone in third to secure the title and the IAME International ticket. Garrett Adams (Comet / FA Kart) drove to fourth with Kyffin Simpson (SCR / Tony Kart) rounding out the top-five. Canadian Mac Clark flipped in a heat race on Saturday, bouncing back for fast lap of the race in the Final today, driving from 21st to sixth. It was a toss up all day in the KA100 Junior division. Dru Lyda (Merlin) set fast time in qualifying while Donald Whorton II (Tony Kart) took the win in the Prefinal. Both Lyda and Whorton were shuffled back early on with Spencer Lofton (Tony Kart) taking the point. That was until Garrett Adams (FA Kart) charged from 13th on the grid to the front. He brought Hayden Jones (Kosmic) with him. The two got away and settled the fight for the win on the final circuit. Adams was able to edge Jones at the line by 18 thousandths of a second, however, a bumper penalty took the win away. This put Jones at the top of the podium while moving Maximilla Opalski (FA Kart) to second and Adams down to third. Whorton recovered for fourth with Lyda in fifth. Saturday winner Jacob Graham (Exprit) ran seventh, earning enough points to become the inaugural class champion. The return of the IAME Masters division welcomed five winners in six rounds. Darin Marcus added his name to the list with a solid performance on Sunday. Marcus (Fullerton) was able to work his way up to the lead and the win in the Prefinal. Two-time winner Scott Roberts (SCR / Tony Kart) jumped out to the lead with Marcus and Scott Kopp (Innovative / Exprit) giving chase. Both worked past Roberts and began dicing for the lead. This brought Roberts back into the mix as he took back second from Kopp. This was enough for Marcus to cruise to the win. Roberts ended up second with Kopp in third. Laurentiu Mardan (Tecno) ran to fourth over top qualifier Andriy Tsyupka (Tecno), securing the series title and the IAME International Final ticket to France. Sunday was a great rebound for Jace Park in Mini Swift. The Parolin driver was among the top drivers early Saturday until an off-track run and other issues put him at the back, before he drove his way up to 10th in the Final. That momentum carried over into Sunday with Park setting fast time in qualifying. Brent Crews (Nitro) took the Prefinal win in what was a heated battle with a large lead group. It was very similar in the Final, with another large group fighting for the top positions. In 14 laps, there were eight official lead changes. Park went back as far as sixth before retaking the lead on lap 10. Crews jumped on his bumper until the final circuit. In the I-70 corner, the two criss-crossed on the entry and the exit. The drag race to the line was close, just 12 thousandths with Park grabbing his first series victory over Crews. Jeremy Fletcher (Kart Republic) won the third spot over Elliot Cox (Vemme) with Noah Baker (Kart Republic) in fifth. Placing eighth, Kai Sorensen (Tony Kart) was able to claim the series championship and the ticket to the IAME International Final in France. Ben Maier had to work for his fourth victory of the season to lock up the Micro Swift championship. Maier (Nitro Kart) qualified third but was only able to place fourth in the Prefinal. Maier was quick early in the Final, jumping to the lead on lap four, and leading the rest of the way. Hoyt Mohr and Aryton Grim kept it close to the very end, making it a Nitro Kart sweep of the podium. Prefinal winner Spencer Conrad (Nitro Kart) drove to fourth with top qualifier Cameron Brinkman (Merlin) in fifth with the fast lap of the Final.